Visitors to the International Cryptozoology Museum (the world’s only!) can now view the artwork of two students from the University of Southern Maine. 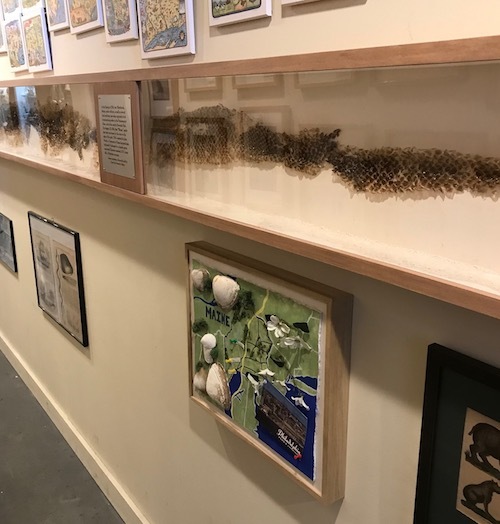 First-year students Anna Howarth and Lydia Roberge recently had their work permanently installed at this unique museum featuring artwork and other curiosities, located at Thompson’s Point in Portland. 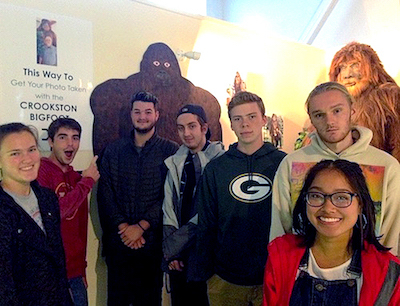 As part of their freshman core curriculum, the students visited the International Cryptozoology Museum for the class “Art Inside the Museum and Out” with Carolyn Eyler, Director of Exhibitions and Programs of the USM Art Gallery. The course facilitates students' transition to college by engaging them in active and collaborative learning that enhances their inclination and ability to view complex issues from multiple perspectives. In particular, their “Cabinet of Curiosities” project was designed to address the class goal of exploring human culture and the natural world in an open-ended, visual and interdisciplinary way. Founder and Director of the International Cryptozoology Museum, Loren Coleman, visited the class to see the projects and then invited the students to donate their pieces to his collection. 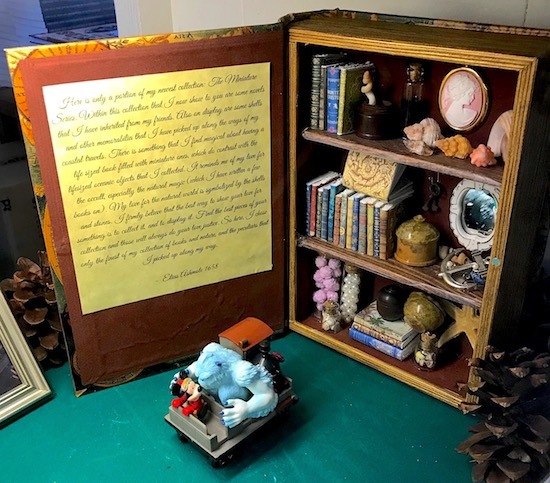 “The International Cryptozoology Museum is proud to install two examples of Professor Carolyn Eyler’s class’ cabinet of curiosities art projects. Ms. Anna Howarth’s work captures the love of book collections in such creations, and Ms. Lydia Roberge’s multiple object piece gives a nod to Maine and her homeland. Both are now in the Museum, greeting visitors from around the world,” said Coleman. Howarth, who plans to major in chemistry, created a miniature "Cabinet of Curiosity" and it's the first project on view to the left in the educational section of the exhibit at the museum. It features a letter, antique in appearance, that Howarth wrote from the perspective of Elias Ashmole, her research subject. Ashmole started the first museum in England by donating his book collection to Oxford. Roberge, who will continue her studies as an English major, described her piece "Home" below. “The story behind this map is a simple one. When many people think of family, they also think of home. In this map we have two states split into two; Maine and Pennsylvania. On the left is Maine, allowing for Portland to be visibly marked. The same idea goes for Philadelphia, Pennsylvania on the right side – Pennsylvania also having been split in half. Together, these two states make up home. Maine has always been my physical home and place of residence, having been born in Portland. However, most of my family resides in Pennsylvania, specifically around the Philly area. Almost every year I visit them, a way of getting out of Maine to travel, but always excited to return home.